Ex-d vs Ex-i … why should I care? I was a freshly graduated mechanical engineer when I started my career in the maintenance department of a petrochemical plant. One of the many jobs that we needed to attend to was checking the status of the pressure transmitters that were installed on our production lines, making a list of the points that needed attention (i.e. transmitters that were no longer functioning) and then writing up a request sheet for our purchasing team to acquire the replacements. One of the more confusing parts in that process was reading the “Ex Marking” on the label of the transmitter – it usually looked something like this: After reading about the subject and asking some of the more-experienced engineers on site, I was able to learn how to understand that code better; but I was then faced with a dilemma: some transmitters on site had a type of protection designated as Ex-ia (Intrinsically Safe) and others were designated as Ex-d (Flame-proof)… why? And what are the main differences between the two types? 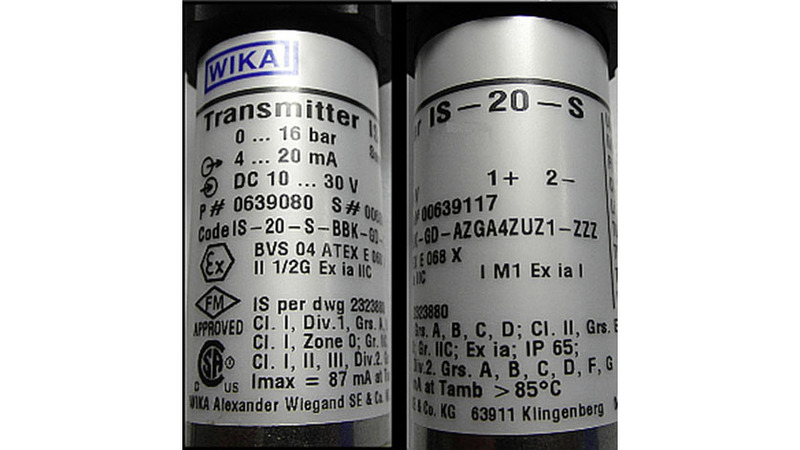 In this short post – and a few coming ones – I will try to shed some light on how the two types of transmitters are different, and some issues that you should keep in mind when dealing with them in your plant. What should be used where? Zone 0/20: An explosive atmosphere is present continuously or for long periods or frequently. Zone 1/21: An explosive atmosphere is likely to occur only occasionally in normal operation. Zone 2/22: An explosive atmosphere is not likely to occur in normal operation but, if it does occur, will persist for a short period only. Based on the classification that the plant designer makes, you will find areas that are classified as Zone 0 areas and some classified as Zone 1 ; and so on… Pressure transmitters with an “Ex-ia” (according to EN 60079-11) type of protection can be categorized as “Category 1G/1D” equipment; and thus be installed in an area classified as “Zone 0,1 or 2 (G) and/or 20,21 or 22 (D)”, as they have a “Very High” level of protection. However, pressure transmitters with an “Ex-d” type of protection (according to EN 60079-1) can be categorized as “Category 2G” equipment; and thus be installed in areas with a “Zone 1 or 2 (G)” classification, but not higher (i.e. not Zone 0) as they have only a “high” level of protection.